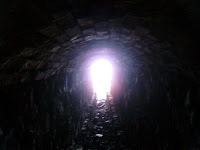 "If you see a light at the end of the tunnel - RUN!" Yesterday I mentioned that I'd be posting about an amazing thing that happened to me this past weekend. On Sunday, I celebrated another birthday - I'm not one that cares too much about a lot of fanfare on my birthday, I prefer to keep it pretty simple, eat some cake, and enjoy a relaxing day! This year was no different in my expectations. I did, however, ask my wife to plan a simple date for us to share since it was on the weekend and the grandparents wanted to keep the kids. I decided we would attend church with the grandparents since that's something we're not often able to do, it was a holiday weekend and I purposely scheduled a "down" weekend in terms of ministry and speaking. During this song and communion I had a wonderful mid-life crisis. It's one that I've had before, just never in this fashion. In just a few moments of time, God began to help me see once again the journey of life He has us on. Full of life-changing decisions, but they pale in comparison to eternity. Complete with opportunity for adventure, yet quite boring if He's not involved. He helped me to see: 1.) my birthday - in light of eternity; 2.) my life - in light of eternity; 3.) my contribution - in light of eternity. I left that service, and now have spent the last 4 days, glaring intently through the lens of eternity - because everything, every-thing, e-v-e-r-y-t-h-i-n-g is dismally small compared to eternity. In light of eternity, He's all that really matters! Man, great post. I have to be honest. Some night I have laid awake thinking about eternity. Some nights I would even say the word 'forever' to myself...so much so that it lost meaning and became weird syllables echoing in my head. For a long time that would just freak me out. The concept of eternity would scare me in ways I can't describe. But those days have been over for some time. You are right, everything is dismally small compared to eternity and it is so wonderful knowing that my eternity will be with God in heaven. No fear there. In fact, nothing but joy, laughter, crystal rivers, streets of gold, etc. I WANT to party for eternity with the heavenly host. Thank you for inspiring my own little 2-second crisis. A great perspective for the day! Thanks, Rick, for this. Powerful! I'd just like to say that I love it when you are in "blog mode". Glad there have been lots of new posts lately! Great post! This is really awesome man! It really puts things in perspective. It is so easy to get completely overcome by life. There are so many things going on in our lives that shout at us for our attention. Several times lately, as I've been driving down the road, I've been mindful that one day SOON I may be driving along and my spirit will just begin to rise from this world. WHAT A DELIGHTFUL THOUGHT! I'm so excited for the day. No more places to be, no more meetings to attend, no more errands to run, no more events to plan, no more car/house/family problems, no more conflicts. It's hard to imagine...UNTIL you focus your attention on eternity. Loved your piece, Rick. Maybe God is preparing our hearts for that day! !